When I see pictures of roses climbing an ornate trellis, the side of an old structure, or even a stone wall, it stirs up romance and nostalgia. I imagine it does the same for many folks due to the number of photos and paintings there are of such scenes. 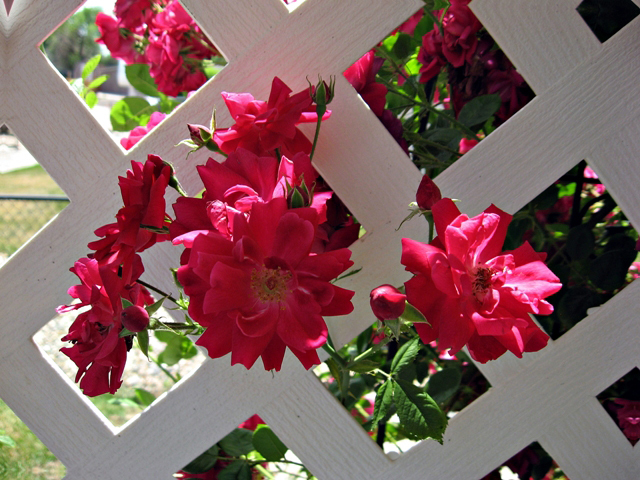 Creating this vision takes effort and a vigilant, rose-loving gardener. Once the rose is bought and planted, training begins. I use either a rubbery wire-reinforced rope or stretchy vinyl type tie off material to attach the canes of the rosebush to the structure. While holding the canes in place, it also allows flexibility so as not to damage the canes as they grow. Even so, the ties will need to be changed as the plant gets bigger. Wait for the canes to grow enough to tie them off and train them to go in the direction where they will be supported. Canes that grow out and too far away from the structure initially can be either pruned out, or monitored as they grow to see if they can be brought back to the desired path. Do not let them go too long though, as unruly canes can make for more work later. Also, do not wait long to tie off and train the canes going in the right direction, as they too can become unruly in the blink of an eye. Once they become unruly, either your mind painting must change to accommodate the new look, or you will need to prune them back and wait for new growth to guide things back. For training rosebushes up the side of a building or stone wall, provide some anchoring sets to tie off to. Drill small holes along the desired training path, about 18 to 24 inches apart going up the wall, and set an expansion or glue-in type anchor, perhaps a friction fit type. I prefer either expansion or glue-in types, as they do not tend to work loose with wind and growth movement like the friction fit ones. The ties are tied to one of the anchors, then brought around the rosebush to the other anchor. Making the tie just snug, not real tight. Expansion or epoxy set anchors are sold at hardware stores. I was once asked to visit a garden where the climbing roses had turned into untamed monsters. Sometimes the mess can be fixed, but it takes work. Lots of pruning, stepping back to look, and then more pruning. 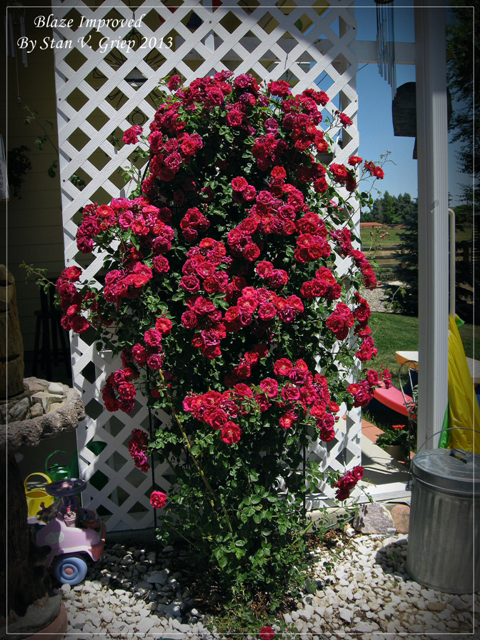 With some older climbing roses this type of heavy pruning means sacrificing blooms, as these older climbers only bloom on what is called “old wood,” which refers to the previous season’s growth. In some cases, like the one I worked on, the bush had gotten out of control. The owner wanted it chopped down and removed. I asked if I could try and bring it back instead. I got an apprehensive okay. Late that fall, once the bush started going dormant, the canes were all pruned down to within 6 inches of the ground. Drastic move you say? The following spring the rosebush did indeed send up new growth. This was gradually tied and trained to a trellis, then onto the fence line on either side. Thus returned a vision of beauty that would cause delight, instead of frustration. Climbing roses will demand your attention for some time. If you are up for the challenge you will be richly rewarded, not only by the beauty, but also the ooo’s and ahh’s of delight from garden visitors and those enjoying the realization of the “mind painting” your efforts have created. Contributor Bio: Stan V. “Stan the Rose Man” Griep is an American Rose Society Certified Consulting Rosarian for the Rocky Mountain District, and a member of the Denver Rose Society. Visit Stan’s website at: https://rosemanstansblog.wordpress.com/.